Red is participating in a Social Skills group for high schoolers with Aspergers. It's Spring Break so one of the parents planned a bowling and lunch activity for the group. It wasn't a drop your kid off kind of situation. Parents had the privilege of hanging out and watching the excruciating pain of their children trying to socialize. Maybe I'm the only one who found it to be painful. Everyone else seemed to be having a pretty good time. Red isn't very coordinated...but bless his heart he tried. 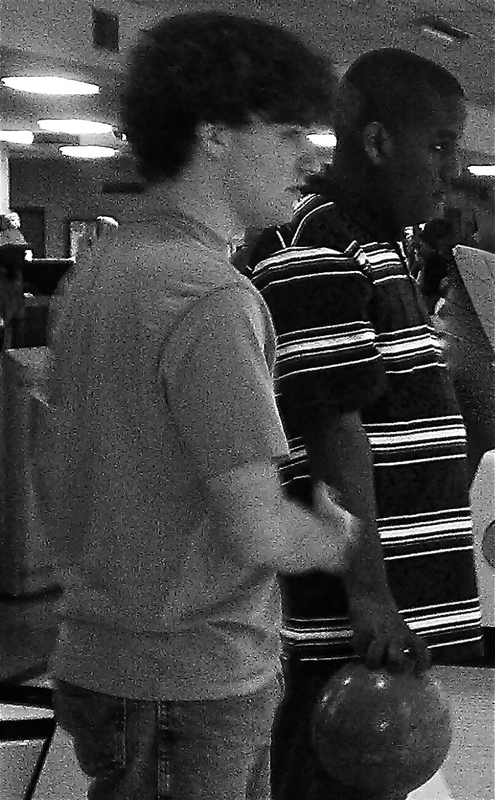 One of the boys is in a bowling league, so he was very good. This was a good thing. The young man did his level best to give Red a few pointers. So did his mom, so did I. He scored very few points, but he did hang in long enough to play 2 rounds. As the group congregated around the table, Red stood off to the side a good distance away. I continually nudged him to sit near the group so that he could join the conversation. Luckily, there were two nuero-typical kids that joined the group --a sister and a cousin, both female. They were very friendly and open. One of them didn't bowl very well either, but she didn't give up and kept a smile on her face. They all tried to engage Red from time to time. He would respond if someone talked to him, but he did not initiate any conversation. He appeared to be pouting for the most part. I told him he looked like he was at the dentist office about to get teeth pulled, not at a social outing with a group of peers. This is what he's been saying for months. "I don't have any friends. I only have one friend. I want to hang out in a group." I know I shouldn't expect miracles. It's going to take time and he may never socialize the way that I would like him too. (This is the son of a girl nicknamed "Social Butterfly" and a father who never stops talking and doesn't meet any strangers.) He has to ease into it, really become comfortable with people and be in the right mood in order to let go and become the charming person that he can be. He says he wants a big group of friends, but the truth is he does better in one to one situations. 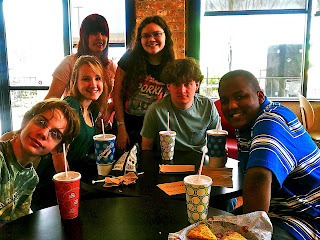 We went to lunch after bowling. That decision within itself was pretty hysterical. A group of teens with Aspergers all with very different pallets, quirks and rigid thinking, trying to come together on a decision on where to go for lunch. Finally, one of the parents had to step in and make a decision and everyone would have to come to terms with it. That is part of the dynamics of dealing with a group. There has to be give and take and not everyone will walk away totally satisfied. Red started off lunch with the sulking face. He didn't like the choice of restaurant. Once, we all sat down and he sat in the middle of the group, (near the girls), suddenly he became animated, full of life and conversation. He managed to smile and talk. I have a feeling if I wasn't there, he may have been like this the whole time. Baby steps are better than no steps at all.